The literary history of the Anecdote carries us back to the classic ages; though this form of composition was scarcely employed by the ancients in the sense in which we now use it. Anecdote is derived from a Greek word, and the Greeks called an unmarried lady an Anecdote. Cicero speaks of a book of Anecdotes on which he was engaged; but which he talks of confiding to a single friend only, as if it was not intended to be ever published; and the earliest book of the kind which has come down to us is the 'anecdotes of Procopius,' an English translation of which, under the title of 'The Secret History of the Court of Justinian,' was published in London in 1674. Such collections, or Ana, have been made in all ages, and in every country where literature has been cultivated. In modern times, Ana has been used to denote collections, either of remarks by celebrated individuals in conversation, or of extracts from their note-books, letters, or even published works - or generally, of particulars respecting them. Of these collections Voltaire has said, in his wicked way, that we are indebted for them, for the most part, to those bookmakers who live on the follies of the dead. A few words as to the origin and success of the work here reproduced may be acceptable to the reader. The PERCY ANECDOTES, published in forty parts, in as many months, commencing 1820 were compiled by 'Sholto and Reuben Percy, Brothers of the Benedictine Monastery of Mont Benger.' So said the title-pages; but the names and the locality were suppose, or de plume. Reuben Percy was Mr. Thomas Byerley, who died in 1824: he was the brother of Sir John Byerley, and the first Editor of the Mirror, commenced by John Limbird, in 1822. Sholto Percy was Mr. Joseph Clinton Robertson, who died in 1852: he was the projector of the Mechanics' Magazine, which he had edited from its commencement to his death. 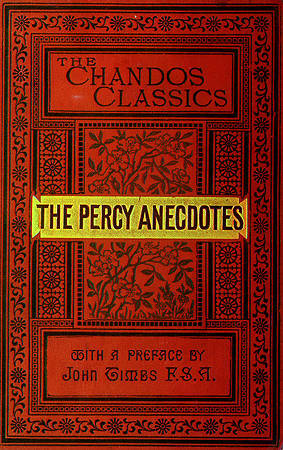 The name of this collection of Anecdotes was not taken from the popularity of the ' Percy Reliques,' as was generally supposed; but from the Percy Coffee House, in Rathbone Place, where the idea of the book was first started by Byerley and Robertson, who were accustomed to meet from time to time to talk over their joint work. The idea was, however, claimed by that clever author/publisher, Sir Richard Phillips, who stoutly maintained that it originated in a suggestion made by him to Dr. Tilloch and Mr. Mayne, to cut the anecdotes from the many years' files of the Star newspaper, of which Dr. Tilloch was then editor, and Mr. Byerley assistant-editor; and to the latter overhearing the suggestion, Sir Richard contested, might the PERCY ANECDOTES be traced. Such, it is believed by the writer, was the origin of the Work, one of the best compilations of its day, which enjoyed a very large sale: the working out of the plan, especially the clasification of the Anecdotes under special heads, and the very careful selection of the materials of most unexceptionable character - is due to the compilers, who, we are informed, were assisted in their labours by contributions from the purchasers of the Work, in its progress of publication. The worth of such aid from family note-books and private collections generally, when placed in judicious hands, may have greatly assisted the originality of the narratives in this celebrated library, for such it deserves to be called. The PERCY ANECDOTES here presented to the public is, as stated in the title-page, 'A verbatim Reprint of the original Edition,' commenced in 1820 and completed in 1823. It is without note or comment; the Publishers deeming the well-earned popularity of the Work the best recommendation of this cheap reproduction. A glance at the annexed List of Contents will convey some idea of the variety and attractiveness of these volumes; and induces the belief that for the leisure half hour, at home or abroad; in the railway carriage or the steamer; by the fireside; or during those intervals of business when the mind seeks relaxation in reading of the varieties of life drawn from unhackneyed sources, the PERCY ANECDOTES may be safely recommended to all classes of readers.